Monica Melissa Patterson exits the courtroom during a break in her capital murder trial Monday, October 16, 2017 in the 370th state District Court in the Hidalgo County Courthouse in Edinburg. EDINBURG — It took 15 days in court to finally get here, after three weeks of exhaustive testimony into the defendant’s and victim’s personal finances. 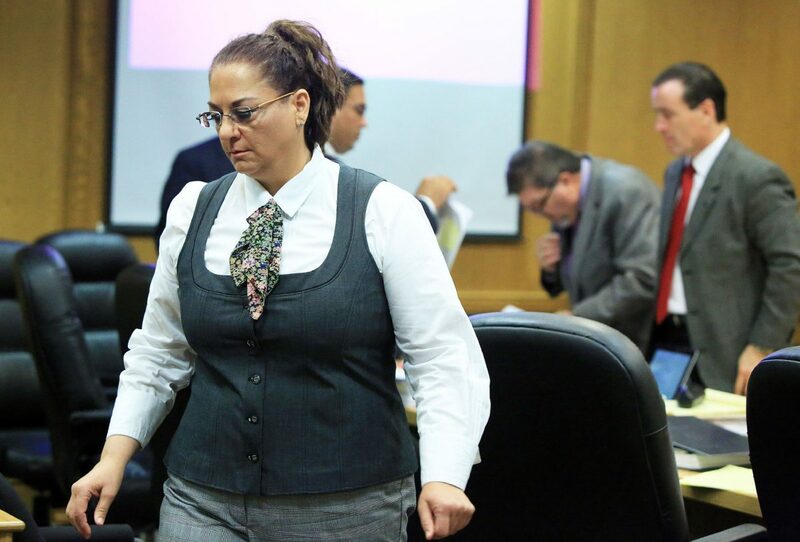 The fourth week of the Monica Melissa Patterson capital murder trial began Monday with prosecutors calling a Texas Rangers investigator, Robert Callaway, to the stand. Callaway was one of the lead investigators in the case and worked for more than six months probing a housekeeper’s claim that her employer was murdered by Patterson. Celestina Mascorro, the housekeeper in question, reported the crime a month later to law enforcement authorities from the Texas Department of Public Safety (DPS), alleging that Patterson killed 96-year-old Martin Knell Sr. on Jan. 28, 2015 to gain control of his estate. Callaway, the ranger who testified Monday, spent until September 2015 collecting evidence and conducting interviews to piece together the murder charge the 50-year-old defendant now faces, not to mention additional time investigating other counts against her. These include theft and misapplication of a fiduciary. 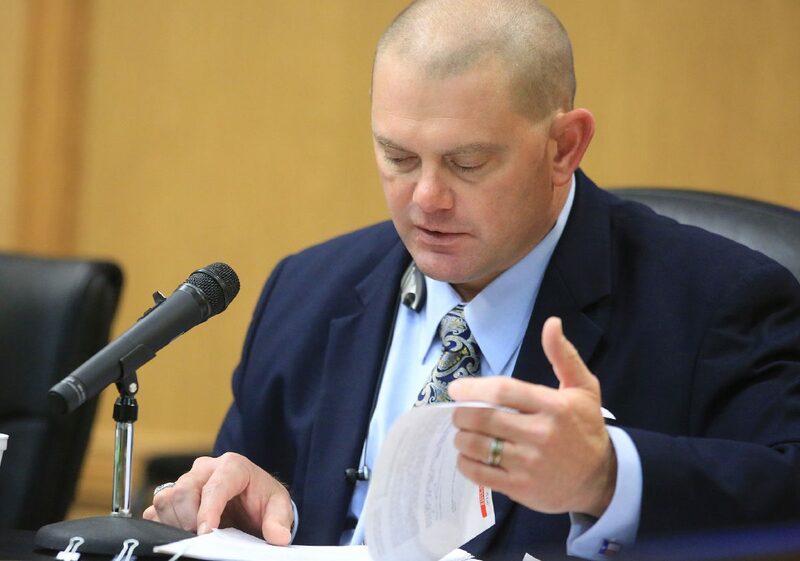 Texas Ranger Robert Callaway reviews his investigation report during his testimony in the Monica Melissa Patterson capital murder trial Oct. 16, 2017. 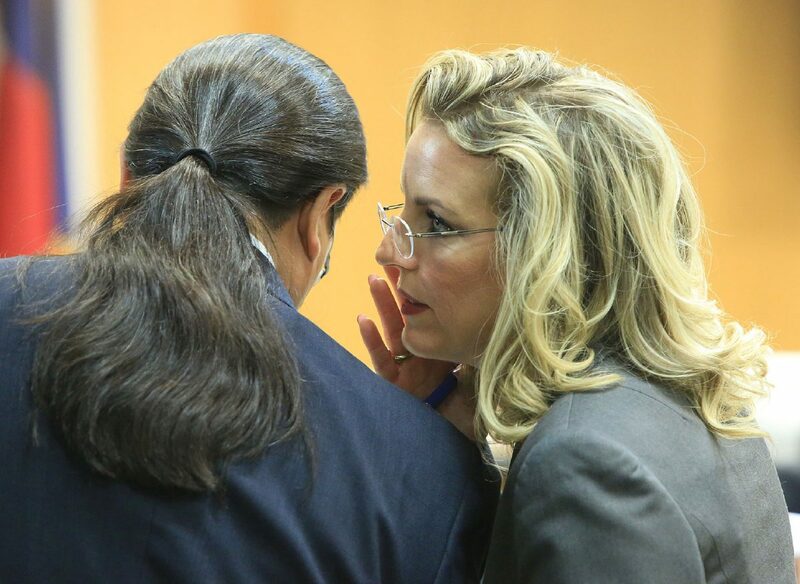 Defense lawyer Brandy Wingate Voss talks with defense lawyer O. Rene Flores in the Monica Melissa Patterson capital murder trial Monday, October 16, 2017 in the 370th state District Court in the Hidalgo County Courthouse in Edinburg. Mascorro, who has yet to be called to the witness stand, was an integral part of Callaway’s investigation — a multi-agency effort that included the Hidalgo County Sheriff’s Office, which initially handled the Knell case as an equivocal death investigation. With DPS directing, Mascorro engineered two staged conversations with Patterson in June and July 2015 — one over the phone and the other at a Whataburger in Mercedes. Citing hearsay, Callaway said he could not tell jurors about the specifics of these conversations. The ranger, however, did say that they related to “the details (Mascorro) had referred to (him)” regarding Patterson’s alleged role in Knell’s death. A week later, Mascorro met Patterson at Whataburger “to discuss the matter of Martin Knell.” This conversation was also recorded as well as captured on video by undercover agents who were at the restaurant — an occurrence former Comfort House employee Michael Merinos correctly anticipated when he was called to testify the second week. Although Patterson again neither confessed nor denied harming Knell, Callaway said she placed herself and Angel Mario Garza at Knell’s house prior to the time she had originally told Callaway during a February 2015 interview with the investigator. In her conversation with Mascorro, Callaway said Patterson “mentioned working on the showers and something about the reason she instructed Ms. Mascorro to wait in the garage” while Garza and the defendant entered the house. Garza, who remains in jail, is alleged to have participated in asphyxiating Knell with a plastic bag, or an unknown item. Lawyers from both the prosecution and the defense — along with Patterson’s appellate attorney, Brandy Wingate Voss — spent much of Monday afternoon arguing whether the audio and video recordings of these conversations should be admitted into evidence. Wingate called the recordings “a backdoor way to get in hearsay,” and said if they were played for the jury without Mascorro being called to testify, the prosecution would be effectively entering a witness without giving the defense the opportunity to cross-examine him. “We would end up in a mistrial,” Wingate said, arguing that entering the recordings into evidence would violate Patterson’s Sixth Amendment right to confront the witnesses against her. Mascorro has been issued a subpoena, but the prosecution has not indicated whether or not she will be called to the stand. State District Court Judge Noe Gonzalez said he would review the footage Monday evening and may inform the court of his decision Tuesday. Callaway’s testimony Monday also touched on his search for approximately $600,000 that was withdrawn from Knell’s bank account between October 2014 and February 2015 — $400,000 of which was withdrawn by the victim himself, and $200,00 was withdrawn by Patterson in the month following his death. In addition, Callaway detailed efforts to verify the alleged $205,000 Patterson stole from Comfort House, the McAllen hospice center where she served as administrator from 2014 until her August 2015 arrest. Callaway will return to the stand Tuesday as testimony continues.